Feel's good, doesn't it? 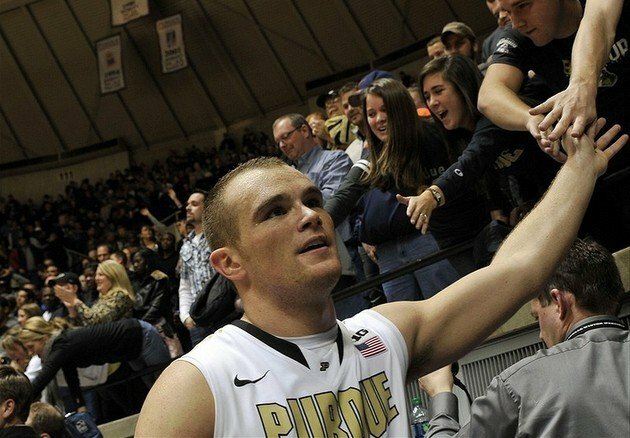 On Wednesday night, this current Boilermaker basketball squad took a big step forward in becoming a true Purdue team by beating the nationally-ranked Illini. This was the eighth straight victory over Illinois, dating back to 2009. If you didn't watch the game, I encourage you to go find it online (at BTN.com?) and sit through the entire thing. You'll be quite pleased to see the things that fans have been looking for all season. How did they do it? Terone Johnson led the team in points (25), rebounds (9), offensive rebounds (3), assists (4), and steals (1). We all know he's the best offensive threat on the team and will get his shots, and any game where he can shoot 50% from the field is one where the Boilers could win, even against the top teams in the conference. 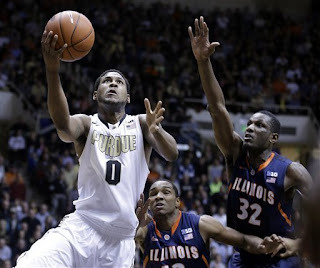 Illinois two-point shooting percentage was 33% (11 for 33). That's thanks to some real Purdue defense as almost every shot was contested. Did anyone think the Boilers would win this game with AJ Hammons only scoring two points? 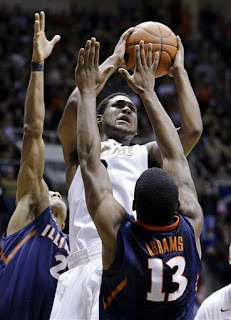 Everyone stepped up, and Big AJ still had a good game, even if it wasn't evident offensively (7 rebounds, 3 blocks). I'd still would love to see some of Lawson's energy rub off on him. The team out-rebounded the Illini by seven, including 12 offensive boards which resulted in 15 second-chance points compared to Illinois' four points. 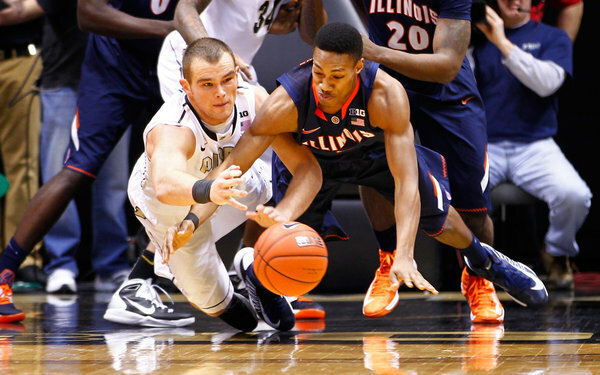 The offensive intensity shown by Terone and the rest of the Boilers resulted in Purdue scoring twice as many points in the paint as Illinois (36 to 18). Jacob Lawson had ten points on only five field goal attempts in just 22 minutes and continued to be a powder keg of energy on defense and the glass (7 rebounds). I'm just loving what he brings to this team, and even with his two-missed free throws down the stretch, he still hit 4 of 6, which I'm OK with. I'll just pretend he missed those others to set up Byrd for the play of the game. 0:21 left - called the timeout heard round the world after fighting through bigger defenders to pull down an offensive rebound. Game-saver. I never thought I'd watch a replay of a player calling a timeout so many times on my DVR or yell so loudly each time either. I simply love this Boiled Sports post about the significance of this win. After watching Brandon Paul intentionally flail his legs into the defender early in the game to get the benefit of a foul call and a four-point play, it was nice to see the refs not fall for that trick the rest of the game. I counted at least three times Paul did it, and DJ Richardson even got into the flopping action, but fortunately it may have actually made their aim worse on those shots. I'd love to see a player like Paul called for an offensive foul and put a stop to that bogus activity. The horrible things these guys learn from "NBA stars." 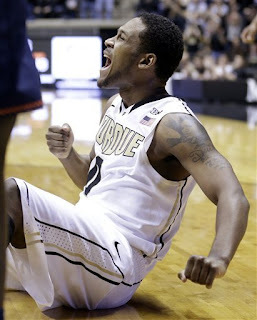 Boiler Up, and keep it going!